I have an iPad 4 that lives in a Kensington KeyFolio with Bluetooth Keyboard that I absolutely love. But, it can be bulky at times, especially when traveling. 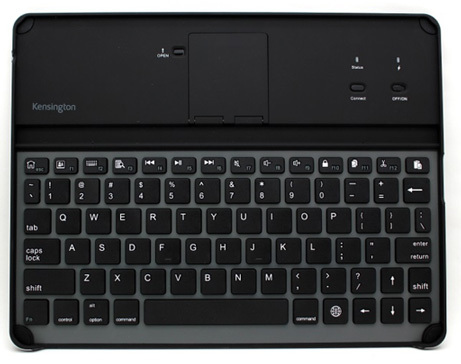 When the opportunity arose for me to review the Kensington KeyCover Hard Shell Keyboard for iPad I grabbed it. 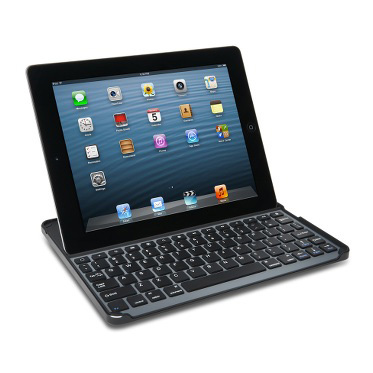 The Kensington KeyCover Hard Shell Keyboard for iPad (Shell for short) attaches to the front of an iPad. The Shell securely supports the iPad in both portrait and landscape modes by a stand that pops open after clicking the “open” button to the left of the stand. Simply pair the Shell via Bluetooth with your iPad and you’re ready to go. 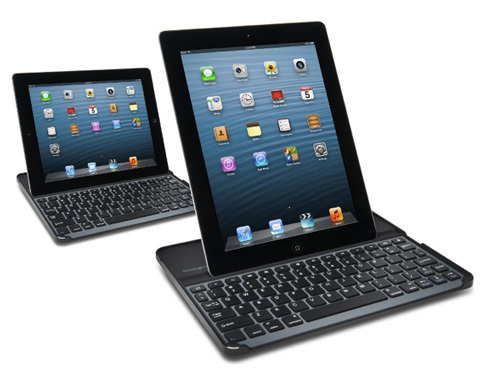 There’s a lot to like about the Kensington KeyCover Hard Shell Keyboard for iPad. The keyboard is a good size; I had no problems typing on it or issues with keys being too close together. That said, after typing on a full size keyboard on a laptop or desktop, typing on the Shell keyboard does take a little getting used to, though most people will adapt very quickly. I also liked the top row of shortcut keys for cut, copy, paste, search, volume control, photo slideshow, keyboard, lock, and home screen. This is especially useful for people who are used to using keyboard shortcuts on their computers rather than a mouse. Four rubber feet on the bottom of the Shell keep it from sliding around the table while in use. In front of the stand is a slot for the iPad. I found landscape mode to be more secure than portrait mode. Portrait seemed a little top heavy, with a chance of the iPad tipping over, though that never happened. Most people will use the Shell in landscape mode for writing or watching videos, as I did. The iPad fits snuggly onto the Shell; it isn’t going anywhere! No worries of the Shell and your iPad coming apart while in your backpack or briefcase. However, this is also a negative. Getting the Shell off my iPad sometimes takes super-human strength! Once that Shell is on it doesn’t want to come off. I struggled each and every time separating the Shell and my iPad. If there’s a trick to make this task easier I’d love to know what it is. If you’re the type of person who insists your iPad is completely covered, then the Kensington KeyCover Hard Shell Keyboard for iPad is not for you. The back of the iPad is totally exposed, making it vulnerable to scratches and dings. A possible solution is to put the iPad in a case and carry the Shell separately, but that defeats the purpose of having a space-saving and lighter solution. According to the Kensington web site, the iPad automatically sleeps or wakes when the Shell is opened or closed. I found this not to be the case. I could see the screen was still on when my iPad was in the Shell. Conversely, I had to awaken my iPad when I took it out of the Shell. Overall, the Kensington KeyCover Hard Shell Keyboard for iPad is a good purchase for users who like to type a lot on their iPads and don’t like the built-in keyboard. I won’t be using this as my everyday iPad cover, but next time I travel with my iPad, the Kensington KeyCover Hard Shell Keyboard for iPad will be coming along.